In the early 1990s I unwittingly moved into a Gion Festival neighborhood. I knew it was the traditional kimono district, but I didn’t know anything about kimono, nor about the festival, and certainly not that neighborhoods of kimono merchants had sponsored the festival for as long as anyone can remember. One day I literally stumbled upon the festival’s gigantic floats, some as high as downtown buildings, and marveled at their exquisite adornments of exotic textiles and carvings. I didn’t know what I was looking at, but it blew my mind. I was a budding investigative journalist aspiring to fluency in Japanese language and culture, and a few news articles gave me the excuse to ask lots of questions, mostly about the origins of those eye-catching textiles, and why women couldn’t participate. Learning about the textiles was interesting and fun. Freshly graduated from college, and armed with the knowledge that historians were arguing that women formerly took part in the all-male festival, I felt obliged to educate these elderly Kyoto men that so-called tradition couldn’t hide discrimination. That made my heart beat uncomfortably fast, but I guess that was fun too. 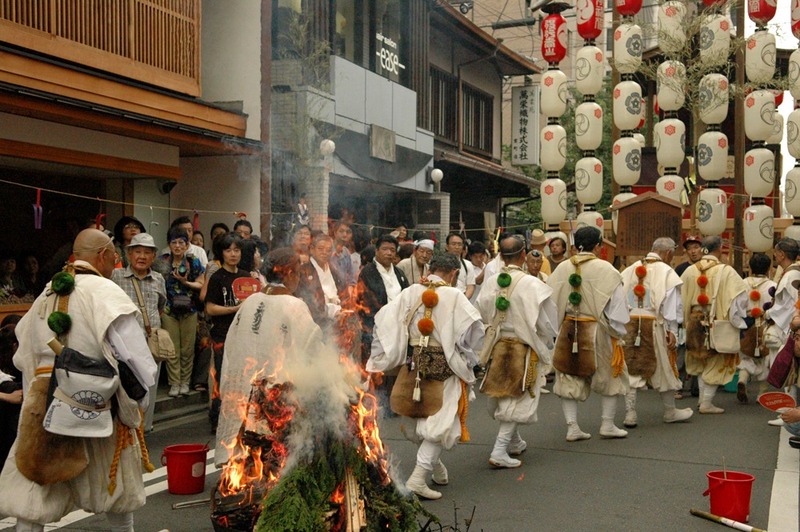 Over time I learned that the month-long Gion Festival is a tribute to the deities who reside at the Yasaka Shrine in eastern Kyoto: Susanō-no-Mikoto, his consort Inadahime-no-Mikoto, and their eight children. The festival originated in the late 9th century, with a procession of halberds or hoko representing the districts of ancient Japan. They supplicated Susanō, the god of storms and pestilence, after particularly debilitating flooding of the Kamo River and an ensuing plague. By the 10th century, the annual summer rainy season and associated sanitation-related illnesses made the entreaties a yearly event. Later, Kyoto’s kimono merchants used the occasion to display their refinement, international sophistication, and power: the more opulent the float decorations, the more awestruck the populace. Naturally the families who’ve lived in the neighborhood for centuries devoutly carry the flame of tradition. One patriarch relates how he still prays for good health during every festival, recalling how his teenaged brother died from “summer illness” during the rainy season. Another woman’s family name is mentioned in Japan’s oldest written records as supporters of the 6th-century Prince Shōtoku Taishi. She helps sponsor a float dedicated to him, as her forebears did since as far back as she knows. Throngs of visitors line the downtown streets to watch the famous “peak” of the festival, the procession of all 32 floats through the city center every July 17. The doyens of each float’s neighborhood stately lead the way in fancy historic garb. 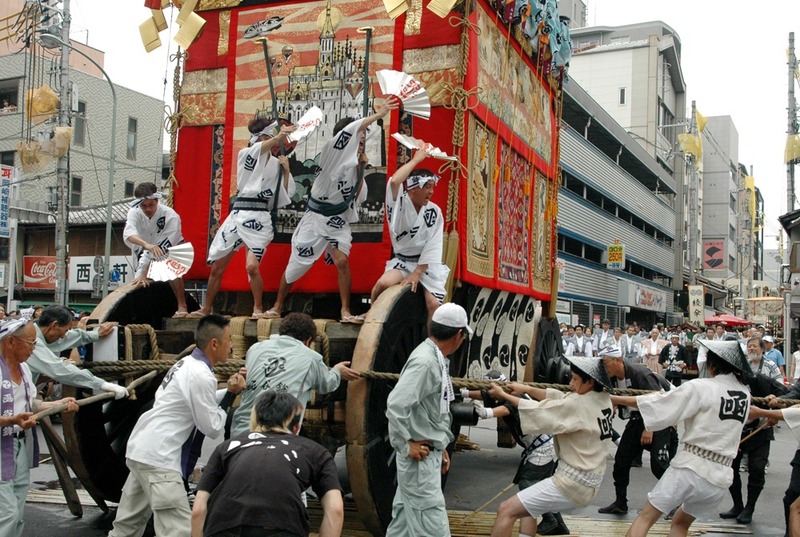 The nine larger floats, or hoko, weigh over 10 tons and are heaved by dozens of toiling men in straw sandals, haori jackets and cone-shaped straw hats. Their textiles sway as the rolling structures creak and shudder, reminding us that they’re simply timbers lashed together with rope and dressed up with weavings, just as we ourselves are bones connected with ligaments layered over with skin and clothes. Inside, up to 50 men and boys (and nowadays a few girls and young women) are crammed onto narrow wooden benches in an area so small it has to be seen to be believed, reportedly to prevent anyone from falling out. Small boys are sometimes tied to a post for extra safety. These musicians chant and play drum, flute and bell in a unique music akin to that of noh theater, pointing to the festival’s ancient shamanic elements. The music serves to mesmerize the crowds and spur on the rope-pullers as they endure this grueling four-hour-long test of their strength, endurance and will. Each of the nine larger hoko used to also feature a chigo, or “divine child,” a pure vehicle to embody the Shinto spirits or kami, traveling down from the sky via the hokos’ cosmic lightning rods. Today chigo only play their ceremonial role on the leading Naginata Boko, while those of the other hoko were replaced by carved statues or dolls for unknown reasons nearly a century ago. Meanwhile, each of the 21 smaller festival floats, or yama, orients around a statue or group of statues, believed to be inhabited by a deity or folk hero who possesses saint-like status. Some of these objects of veneration are easy to understand, like Kannon, the bodhisattva of compassion (celebrated at the Kita and Minami Kannon Yama floats), or Shōtoku Taishi, who made Buddhism Japan’s national spiritual tradition in the 6th century (Taishi Yama). Others include characters from noh plays (such as “The Reed Cutter” at Ashikari Yama), from Chinese parables (Kakkyō Yama), or heroic Japanese battles (Hashi Benkei Yama). Historical evidence indicates that dance, music, theater and shamanic rituals previously took place on and around the floats. In the early 1990s, the festival’s international profile in the art world jumped, due to the publication of a book on its eclectic collection of international textiles, co-authored by Nobuko Kajitani, then with New York’s Metropolitan Museum of Art. Even the lower-quality textiles can be rare and beguiling: it seems that Koreans were painting and weaving Escher-like designs into textiles hundreds of years before the European artist was born, while another group of Asian textiles features long hairy fibers of mysterious origin, still protruding considerably from the pile after centuries of wear and tear. They aren’t particularly impressive to behold, yet only a few others like them exist elsewhere in the world. Less studied as a group, the festival’s Japanese embroidered textiles are exquisite, and portray curious scenes —from Taoism, Buddhist symbology, geomancy — that indicate kimono merchants’ erudite aspirations. 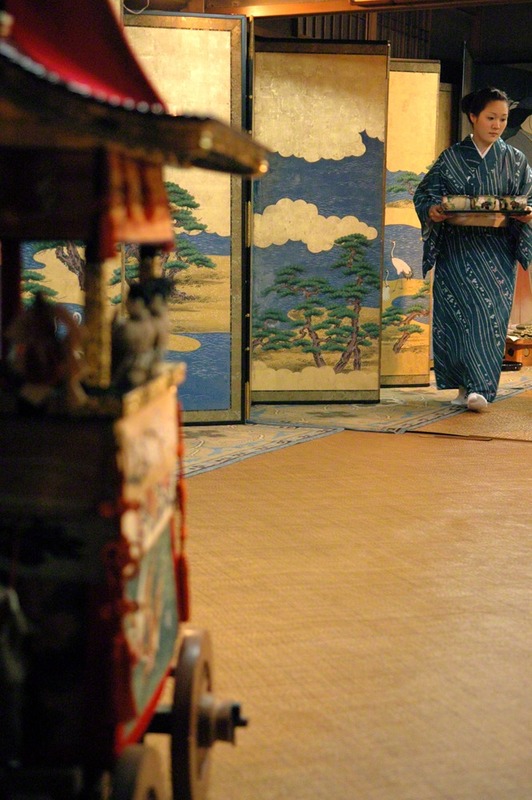 Before the Tokugawa shogunate closed the country to outside influence, Kyoto’s kimono neighborhoods were an important destination for Silk Road traders, and constituted a highly diverse international crossroads. Kyoto seems tightly-laced on the surface, but its foundations are more cosmopolitan than generally thought, and the festival exalts this cultural diversity. When I first moved into the neighborhood, most of Kyoto turned out for the week-long display of Gion Festival treasures: textiles, carvings, statuary, paintings, folding screens and so on — the crowds combined with the semitropical summer humidity and heat were (still are) hard to bear. Nonetheless, one could still sense its origins as a low-key neighborhood event, with friends, families and colleagues passing the time together, languidly waving fans as they hospitably shared neighborhood heirlooms with the general public, and patiently answered questions from a curious young foreigner. However, about a decade ago, the city of Kyoto and national tourism authorities ramped up promotion of the Gion Festival as a tourist attraction. By 2008, Kyoto Police estimated than more than a million visitors (mostly Japanese) attended the week-long treasure display and float procession. It’s important to recognize that, at the same time that the nationwide popularity of the festival is increasing, the neighborhood fabric that’s historically held the festival together is weakening. The bursting of Japan’s economic bubble in the early ‘90s, caused the kimono industry to collapse, and the number of traditional festival sponsors to rapidly dwindle. Modern, single-family (or single-person) apartments have replaced traditional multi-generational homes in this central downtown area, so there are fewer youth to learn traditions by osmosis from their elders. Restaurants, office buildings and holiday apartments have replaced traditional companies in their historic buildings. While rental contracts may include a modest “festival fee” and volunteer time may be requested for festival-related undertakings, unsurprisingly day-workers or new residents don’t have the same commitment to supporting the festival as the previous, multi-century residents did. 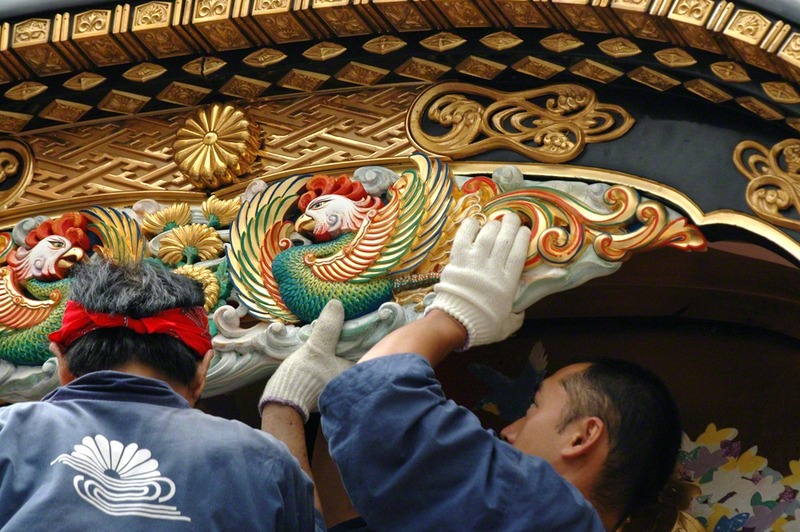 Other festival funding comes from sales of talismans and mementos, and in the form of subsidies from the municipal, prefectural and national governments, with the regulations that accompany such support, and varying degrees of skill in use of those resources. Nowadays many of the remaining festival patrons are seniors, commonly without cellphones and computers. At times the resolve of their commitment moves me to tears; yet it can’t make up for the current lack of infrastructure and humanpower to accommodate a million visitors, who need to eat meals, recycle empty beverage containers, use the toilet, and cope with drenched raingear in the tight exhibition spaces. Thus we see a pivotal shift: formerly residents participated in and thrived on perpetuating their own neighborhood culture, and non-residents were welcome as guests. Nowadays residents are vastly outnumbered by visitors, who eagerly consume that neighborhood culture, mostly for free. On top of that, visitors need – and have come to expect – to be provided with services accompanying their cultural experience. “You wouldn’t believe the number of people who ask us to hold their water bottles or shopping bags while they go look at the treasures,” relates a friend at one of the floats. He’s over 70 and doesn’t have any problem saying “no,” seeing as how visitors are basically crashing his party, invited by tourist organizations but not by him or anyone he knows. How to handle this enormous transformation? Traditional Japan had deep roots in sustainable practices, largely lost in its haste to modernize. A more contemporary perspective on sustainability has yet to take hold in traditional Kyoto, and the Gion Festival presents a fascinating challenge. How can we move away from loving the festival to death, towards enjoying it in a synergistic way? How can we visitors morph our practices, from consuming the festival to supporting it? As Buckminster Fuller observed, this planet didn’t come with an instruction manual. One festival patron, a successful businessman, advocates passive fundraising among visitors. “With a million people coming to the festival, even small donations can add up pretty quickly,” he reasons, and it’s one hopeful idea. As a writer, a practice of explorative, shared learning comprises the best way I’ve found to respond. 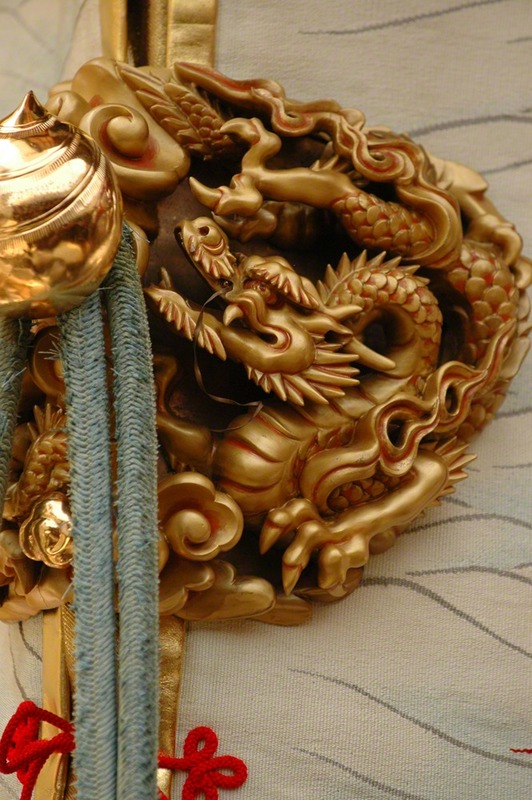 Exploring Gion Festival traditions, for example, reveals a living, metamorphosing organism made up of millions of people’s contributions over 1100 years. Festival upholders sharing their accumulated knowledge and experience with the likes of me form a kind of invitation to be incorporated as another cell in that grand organism. 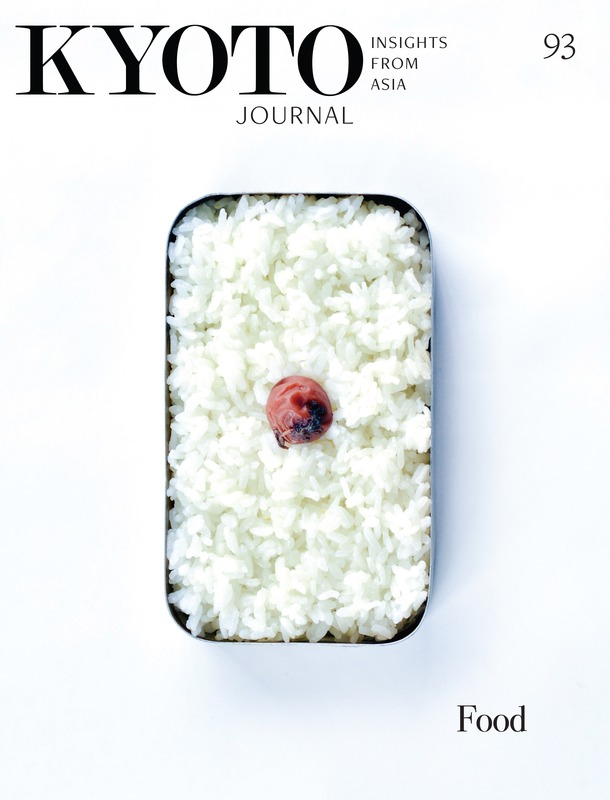 Exercising contemporary ways to share — via the English language, the internet, social media — what I’ve learned about the Gion Festival with you, reader, invites you to also move beyond merely consuming culture, to discover your own ways to become a part of the ongoing health of the festival organism as well. The only limitation is our imaginations. For those who are paying attention, the universe is, essentially, open source. Twenty years after my first Gion Festival queries, one of my favorite things is to sit and chat about nothing in particular over a cup of tea with the generous and interesting festival folks I’ve had the privilege of getting to know. As an American woman, I’m living proof that the all-male festival is open to outsiders, female ones at that; like life, it’s a work in progress, and evolution is slow. I’m well aware that the people running the festival set the terms, and they aren’t ones I would have chosen when I started this journey. The conditions tend towards basic human virtues, such as respect, appreciation and humility. I’m not naturally strong in any of these. 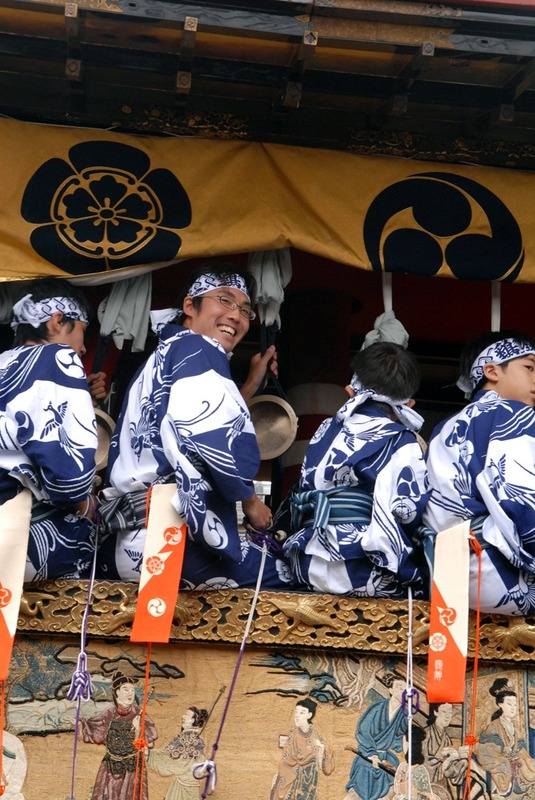 Exploring the ancient and living Gion Festival, and getting to know the people who perpetuate it, continues to be a type of training, perhaps about what it means to be a human being.